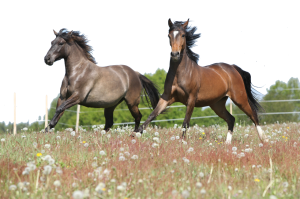 Changing seasons can bring about potential problems for horses and horse owners. Pasture quality fluctuates with every season, but the shift in quality from summer to fall is significant. During the fall, there are often warm, sunny days and cool nights. Pasture plants manufacture sugars in the presence of water, carbon dioxide and sunshine, and then use those sugars to fuel growth during the night. However, when nighttime temperatures drop in the autumn, it becomes too chilly for plants to grow and the sugars are stored for later use. This leads to a concentration of stor ed sugars in the plants, which may increase the risk of digestive upset or laminitis in some horses. Horses at most risk are those that are significantly overweight or those that have trouble managing normal blood sugar levels and are sensitive to sugar content in the diet. This entry was posted on Monday, September 3rd, 2018 at 12:54 pm	and is filed under News & Updates. You can follow any responses to this entry through the RSS 2.0 feed. Both comments and pings are currently closed.